The future is urban: the population of the world's cities now grows by a million people a week—which means a metropolis the size of New York is added to the global urban population every two months. How can we ensure that the cities we're building will make us happy, healthy, and connected? 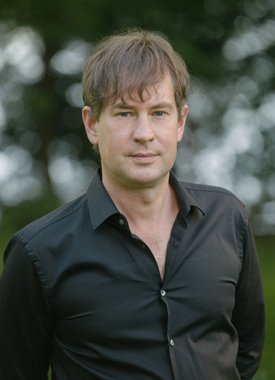 For award-winning author Taras Grescoe, the answer is clear. In the twenty-first century, the most successful cities will be built around subways and Skytrains, commuter rail and tramways, light rail and bus rapid transit. Walkable neighborhoods, well-designed public space, and superior bicycle infrastructure are a crucial part of the mix. But the key to making our cities sustainable, accessible, and equitable lies in planning for great public transit. In his internationally acclaimed book Straphanger (Henry Holt, HarperCollins), Grescoe visited fourteen cities around the world, from Bogotá to Tokyo, to look at which places are getting the sustainable mobility formula right. He is also a leading voice on urbanism, whose writing on cities has appeared on the op-ed page of the New York Times, The Guardian, Monocle, and The Atlantic's CityLab. A familiar presence on CBC radio, television, and NPR, he has been named one of the top influencers on the theme of urban transportation on Twitter. Grescoe's popular presentation on the best (and worst) in transit and mobility has seen him speaking to audiences on three continents. In dozens of keynotes, from Shanghai to Portland by way of London and Halifax, he has delivered a nuanced message about the future of urbanism, the perils of planning cities around freeways and cars, and such offbeat mobility solutions as the outdoor escalators of South America and the mini-metros of Italy. To read more about Taras' award winning look at how cars brought our cities to the brink of disaster, and what we can do to save them, visit the Straphanger site.